Cole kept the visual weight low by using rough-cut stone at the first floor, planar rusticated stone at the second, and dressed stone above. By 1889 developer Henry Heinken had collaborated with architect James W. Cole on several apartment building or residential hotel projects. That year they would work together again after Heinken purchased the two lots at the northwest corner of Central Park West and 87th Street. The rapid development of the Upper West Side was evident in the recent history of the property. The Vanderpool estate had sold it just months earlier to operators Maclay & Davies. The partners resold it to Heinken for $42,500—in the neighborhood of just over $1 million in 2016. Cole designed a five-story, brownstone-fronted building that melded Renaissance Revival with Romanesque. Stone carvers were put to work embellishing the façade with panels, friezes, capitals, and tile-like decorative buttons. Henry Heinken was obviously highly pleased with the design, for he had Cole create a near-copy of the building at No. 151 West 22nd Street almost simultaneously. Stone carvers were kept busy creating the elaborate facade decorations. The apartment building was completed in 1890. Unlike so many of the Upper West Side flat buildings, it used its address rather than a name for identification. No. 3 West 87th Street filled with professionals like Professor John C. Krause. Moving in with him and his wife was Krause’s widowed mother-in-law, Frances D. Porter. Born into the wealthy Philadelphia Davis family, Frances had married Capt. D. W. Porter of the United States Army. She died at the age of 66 in the Krause apartment on November 24, 1896 and her funeral was held there three days later. A face hidden within the foliate carving was one of the many playful details Cole incorporated in his design. Resident Marie de Montalvo was ahead of her time. She was a college graduate, a professional writer, and, most surprisingly, she retained her maiden name after marrying Robert Neville. She made her opinion about Civil War motion pictures clear in a letter to the editor of The New York Times on July 23 1913. The subject was wildly popular at the time, with a reported 98 films based on the Civil War produced that year alone. Interestingly enough, within eight years Marie de Montalvo would become a columnist for The New York Times rather than merely a reader submitting in letters to the editor. At around 11:00 on the sultry hot night of June 25, 1906 Harry Kendall Thaw shot architect Stanford White on the rooftop garden of Madison Square Garden. The sensational and scandalous tale of infidelity, jealousy and murder riveted the nation. On January 23, 1907 the long jury selection process began. Among the potential jurors was an apparently not overly-enthusiastic Walter McDougall, who lived at No. 3 West 87th Street. The lifestyles of the reticent juror and his wife reflected the social and financial status of the building’s residents at the time. On August 2, 1908 the New-York Tribune reported on many Manhattan families who maintained summer homes in the Pocono Mountains. The article included Highland Dell, the summer home of Walter McDougall near Stroudsburg, Pennsylvania. Albert’s sisters were identified in the social columns as “the Misses Macgregor.” On February 20, 1910, for instance, The New York Times noted “Another card party of the week was that given by the Misses MacGregor [sic] of 3 West Eighty-seventh Street. The favors were appropriate to Washington’s Birthday.” The Macgregors would remain in the apartment at least through 1913. Adding to the literary tone in the building set by Marie de Montalvo were authors Rossiter Johnson and his writer and activist wife, Helen Kendrick Johnson. 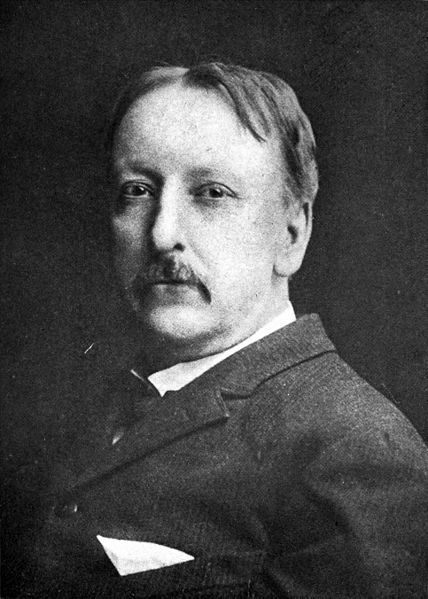 Born in 1840 Rossiter was a writer and editor who had earned his reputation writing articles for periodicals, editing scores of other authors’ works, and writing both fiction and non-fiction. Among the books he wrote while living at No. 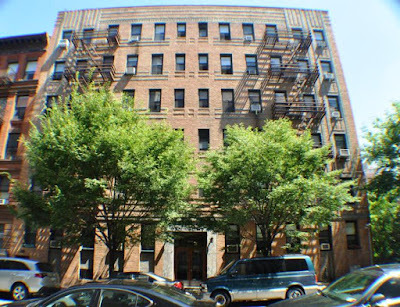 3 West 87th Street were The Clash of Nations, Captain John Smith, Episodes of the Civil War, and his wife’s life story, the Biography of Helen Kendrick Johnson (published in 1917). While living here he was editor of Appleton’s Annual Cyclopaedia, a position he had held since 1883. Johnson had married Helen Louise Kendrick in 1869. Shortly afterward she began writing children’s literature, poetry and travel articles. But her greatest recognition would come when she took a fervent stand against women’s suffrage (as did her husband). In 1897 she wrote Woman and the Republic, which argued that women did not need the vote to gain equality and that woman’s role as home keeper was essential to maintain the American republic. In 1910 she founded the Guidon Club, an anti-suffragette organization. Another writer-editor in the building by 1924 was 35-year old Lester Douglas Wise. An associate editor of The American Standard, a semi-monthly magazine, Wise found himself in trouble with Governor Alfred E. Smith that summer. 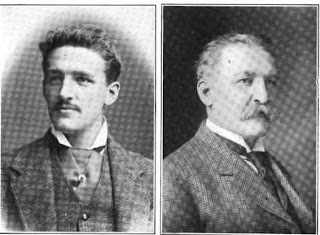 On the afternoon of Tuesday June 23 six newsboys were stopped from selling the magazine and two days later Wise was arrested for libel, along with the editor, 46-year old Charles Louis Fowler, and his son Louis. An article in the magazine entitled “A Patriot Aged Twelve” was purported to have been written by a 12-year old boy. It depicted the Catholic Governor as a “wet papal Governor” and protested the possibility of a Catholic President. No. 3 West 87th Street was home to writer and thinker Gregory Polonski by the early 1930s. Born in Russia in 1872, he had taught in the Universities of Petrograd and Leipzig. He and his wife, the former Anna Neitzschik, had arrived in America in 1921. Polonsi wrote many books and treatises on philosophical subjects and was best known as an exponent of the Spinozistic metaphysical philosophy (which maintained that all things in nature “have been determined from the necessity of the divine nature to exist and produce an effect") and Cartesian logic, based on the work of Rene Descartes. While her husband wrote and lectured, Anna Neitzschik Polonski was both an artist and singer. A contralto, she was a member of the Metropolitan Opera Company. She remained in the 87th Street apartment following Gregory’s death on April 12, 1933. Another operatic residence was baritone Martino Rossi in the 1940s. He had sung with Chicago, Philadelphia and New York opera companies and, since 1939, was a voice teacher. In the fall of 1949 he became ill and on Sunday, February 6, 1950 he died in his apartment at the age of 58. Little has changed to the exterior of James W. Cole’s brooding brownstone building after nearly 140 years. As the apartments were broken up and reconfigured, the interiors were lost; replaced by 20th century functionality. Nevertheless, No. 3 West 87th survives as a delightful relic of early apartment living. In 1796 a group of black New Yorkers, frustrated with the racism they endured at the John Street Methodist Church, created their own congregation. 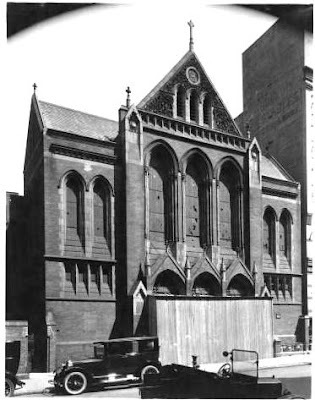 The first black church in New York, the African Methodist Episcopal Zion Church generally followed the Wesleyan tenets; but was organized with bishops, like the Episcopal Church. In 1864 the congregation took over the former Dutch Reformed Church at Bleecker and 10th Streets. By the turn of the century there were other branches of the AME Zion Church, earning this congregation the name Mother Zion. In 1903 trustees laid plans to move northward from Greenwich Village. The church building was completed in 1904 at a cost of $40,000—just over $1 million in 2016 dollars. Sargent had produced a brick-faced neo-Gothic structure trimmed in brownstone and terra cotta. A centered pavilion with three entrance doors above a wide set of stairs projected slightly away from the main building. Its dramatic full-story gable, clad in rough-cut stone, thrust above the peaked roof. Three grouped, soaring Gothic-arched stained glass windows which rose above the entrance porticos formed the focal point. Pastors of black churches in the early decades of the 20th century dealt with tense racial relations, bigotry and the challenge of blacks coexisting with a not-always welcoming white community. Such was the case in August 1908 when two days of race riots in Springfield, Illinois drew national attention. On August 14 a mob of white citizens—estimated at between 5,000 and 10,000--marched on the Springfield jail with lynching on their minds. They demanded the release to them of two black prisoners, accused of violent crimes against whites. The rabble was informed that the sheriff had already transported the men to Bloomington, 64 miles away; not only for their safety but in the hopes of avoiding racial trouble. The infuriated mob turned its rage on the black community. For two days buildings were burned in black neighborhoods and seven people were killed. Property loss was estimated at $200,000 and thousands of state militia were required to restore calm. The building was purchased by the New York City Society of the Methodist Episcopal Church. It became home to the Methodist Swedish Church, also known as the Battery Swedish Church. 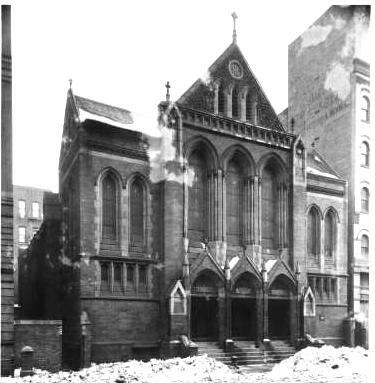 The Swedish Church shared the building with the Central Baptist Church in 1915 while that congregation erected its imposing church building at the corner of Amsterdam Avenue and 92nd Street. But instead, the operators resold the church to the Benkay Amusement Company, which converted it to a motion picture theater, the Endicott. Rather amazingly, while the interior was renovated to accommodate the movie theater, the exterior remained untouched. When this photograph was taken the former church was undergoing alterations to a motion picture theater from the collection of the New York Public Library. It may have been the advent of the Great Depression which prompted Benkay Amusement to close the Endicott in 1930. Certainly motion pictures were high on the list of non-essentials which were cut out of the budgets of struggling families. In any case, in 1930 the firm sold the old church building. The New York Times reported that a “47-family apartment building” would be erected on the site. But nothing happened for four years. Then on May 21, 1934 architect George C. Miller filed plans for a six-story, $150,000 apartment building. The brick and stone Art Moderne structure survives; and the short-lived church-turned-movie theater is long forgotten. Among these was the Werner tenement, at No. 787 Ninth Avenue. Until 1871 a small building had fronted Ninth Avenue on the site. To the side a horsewalk (a narrow path between buildings) most likely provided access to the brick back building. When Frank Werner demolished the the front structure, he left the old building in the back standing. Anyone passing by the completed building would not make the same mistake. The overblown pressed metal cornice with parapet loudly announced F. WERNER. Despite the gritty surroundings, Werner did not scrimp on materials. The red brick façade was trimmed in sandstone and ornamented with terra cotta and cast iron. F. WERNER is proudly pressed into the ambitious cornice. Below, terra cotta panels include chubby-faced cherubs, nearly indistinguishable from street level. Halzeit's design was a happy medley of styles. The stone cornice above the cast iron storefront included carved classical anthemions. A Renaissance pediment sat above fluted Corinithian pilasters. Neo-classical festoons appeared in terra cotta panels, and rows of stylized sunflowers, influenced by the emerging Aesthetic Movement, formed the cast iron balconette railings. Here delightful finials decorated the corners like cast iron July 4th sparklers. Delightful sunflower railings and detonating finials decorated the stone balconettes. Halzeit's carved details, the brick side pilasters, and the terra cotta band placed the structure a step above the average tenement. The most eye-catching of the details, however, were the carved faces that formed the lintel keystones. The stone carvers let loose their creative humor to produced whimsical characters that may have briefly lightened the difficult lives of the residents and neighbors. The mouth of one is agape--laughing, singing or, perhaps, screaming. Another sticks his tongue out at passersby; and one, with a haughty expression, seems to roll his eyes in exasperation. As expected, the Werner filled with working class tenants. Among the first were Ernest Emden, a miller; Clement Erlinger, coachmaker; and Frederick Bilstein, a bricklayer. It may be that Werner kept the back building for his own family. Werners are listed at this address at least until 1888 when Charles Werner, a fireman, was injured in a deadly fire in the Five Points neighborhood. Another early tenant was not so hard-working. Joseph Roberts ran his “policy shop” from his apartment. Policy games were illegal lotteries, later known as the number racket. The games preyed on low-income persons who dreamed of quick riches. On either side of the centered entrance were retail stores. Peter Feinholz ran one, described in the 1872 city directory as “milk, candy, varieties.” On the other side was the “segar” store of Francis Winter and his wife, Eva. They not only sold, but manufactured the cigars here at least through 1877. Feinholz’s variety store, too, would be in the building that long. As it does today, the central apartment entrance separated two retail shops within the cast iron base. Through the 1870s the tenant list reflected a high proportion of German immigrants with names like Kirchner, Schmidt, Donfelser, Kaltenbacher and Grunig. Their occupations suggest that they were mostly hard working men, simply trying to make a living. Among their professions were grinder, upholsterer, baker and tailor. One family, at least, was doing its best to elevate their son from the miserable environment. In 1884 Hermann Diedrich Lange enrolled in law school. It was no doubt a tremendous financial strain on the family. The old brick back building still stands hidden from the street. But respectable professions could not change the hard-nosed, street-wise character of many residents. John McNeil worked as a longshoreman in the first years of the 1890s. On Saturday night, February 18, 1893 he attended a birthday party at the apartment of another longshoreman, Frank Clark. At some point McNeil and Garret Addis argued. They left the apartment to fight outdoors. The New York Times reported two days later, “McNeil went to Bellevue with a cut over his eye and a compound fracture of the skull. He is likely to die. Addis and everybody at the party were arrested.” The entire group was taken to Bellevue to form an impromptu line-up, from which the dying McNeil identified Addis. Among the other comical faces on the facade is one who tauntingly sticks his tongue out at passersby, and a singer (or possibly screamer). Both support stylized anthemions. Newkirk was removed to the Smallpox Hospital on North Brother Island and a medical team was sent to the Werner tenement building. “Vaccination and fumigation were employed to prevent further spread of the infection,” said the newspaper. The police department’s battle against illegal gambling here had not stopped with Thomas Murray’s arrest in 1874. Twenty-three years later Detective Waters paid a black informant, Perry Steddle, to get evidence against policy shops. Steddle was no doubt chosen partly because of his race which, for the Hell’s Kitchen crooks, would make him less expected to be involved in a police sting. On the afternoon of January 22, 1897 Steddle testified that he had purchased policy slips at No. 787 Ninth Avenue. The difficult conditions of tenement life were exemplified on November 17 that year when Harry L. Rhein died in an apartment here. He was just two years old. Michael Healy and his wife lived in No. 787 in 1914, the year he was laid off from his job as an ironworker. Without an income the 28-year old faced terrifying consequences; only one of which was the possibility of eviction and homelessness. On October 15 he walked to the end of the West 54th Street pier where several men were fishing. He took out a cigarette and asked them for a match. Life in Hell’s Kitchen and at No. 787 Ninth Avenue did not improve in the first decades of the 20th century. Mary Harmon lived in the building with her husband in the early 1920s. On the night of January 4, 1923 she was invited to the apartment of 50-year old auto mechanic Arthur Cole, who lived at No. 409 West 50th Street. He also invited another married woman, 30-year old Henrietta Dalton. At some point during the evening two more women arrived, Anna George and Margaret Clark (both unmarried). Now, it seems, Henrietta and Mary became jealous and “the strife for Cole’s attentions began,” according to The New York Times the following day. Alarmed at the commotion, another tenant opened his window and blew “a police whistle,” which brought Patrolman Harry Reinhart to the scene. He found Mary with a slashed right breast and blackened eye; Anna George with a stab wound in her leg; Margaret Clark with lacerations and bruises and Henrietta Dalton with her right index finger missing. Unlike two of the women who were taken to jail, Mary Harmon was able to pay her $10 fine (about $140 today) and was released. She now had to explain things to her husband back home at No. 787 Ninth Avenue. Another resident to see the inside of a jail cell was Amedia Ricard, who worked as a waiter at the Tree Club at No. 119 East 55th Street in 1932. Ricard was no doubt happy to have a Depression Era job and the Tree Club was an upscale nightclub. The problem was Prohibition, which made the Tree Club a high-end speakeasy. Early in the morning of July 9 that year Federal agents raided the club. They seized $25,000 worth of furnishings “including an elaborate bar,” and a “large quantity of cordials, brandies, liquors and whiskies.” They also seized Amedia Ricard among other employees, who were charged with Prohibition violations. The Hell’s Kitchen neighborhood retained its seedy reputation until the last quarter of the 20th century. By 2000 it was being marketed by real estate agents as “Chelsea Heights” and modern apartment buildings began replacing the old tenement structures. Today a pizzeria and an Afghan restaurant occupy the retail spaces once home to a Victorian variety store and a “segar” shop. Upstairs the tenants, while not living in luxury, enjoy a much improved lifestyle than their 19th century predecessors. And all the while the comical faces of the keystones above continue to amuse the pedestrians as they have for more than 140 years.